The 20th Annual Popular Photography Photo Contest gives photographers the opportunity to win prizes and have their work recognized in the January 2014 issue of Popular Photography as well as on their website, PopPhoto.com. 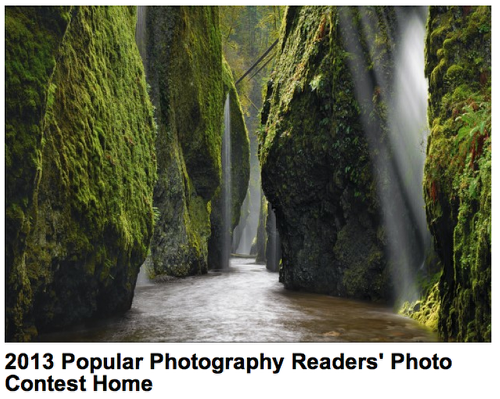 People’s Choice – PopPhoto readers will vote for their favorite image! All entrants will automatically be entered in this category. Submissions: The competition is open to work produced from June 2012 —October 2013. All submitted artwork should be of reproduction quality. Entrants may enter as many times as he/she would like, for $10 per photograph. When submitting your photograph(s), please specify in which category you are entering. All entrants will automatically be entered into the “People Choice” category. The judging will be done by the editors of Popular Photography magazine. Entries will be judged equally on creativity, technical expertise and aesthetic value. Entries will be ranked in descending order. Winner will be featured in the January 2014 issue of Popular Photography magazine. Submissions should be in JPEG format & must be set to maximum image quality Not eligible to enter? I don’t see anything in these rules that state the picture has to be from an iDevice. So … can we use our DSLRs, photoshop in a unicorn and photo-buff ourselves up like Zeus for our submission? Come to think of it – even if we have to use our iDevice, what filters and after-capture touch up is allowed? Well it doesn’t state whether you can or cannot use an iDevice, so I see no reason as to why not. If you’re concerned about it then it would be a good idea to contact Pop Photo directly to ask and please come back and let us all know their response. Looking through the other entries, I see some photos that are touched, but a majority that aren’t. Most photos are also from DSLR camera. I couldn’t find any that were from iDevices. From what I recall, Popular Photography is more interested in shots from the camera that could compare with National Geographic quality rather than post-operative textures and filters. Each entry costs $10, as you mentioned, so I guess they aren’t going to put these type of restrictions out there but I’m banking that the judges aren’t going to pick any photoshopped images.